The invasive Asian clam, Corbicula fluminea, is known as the “golden clam” in the aquarium trade and the “good luck clam” in its native southeast Asia. A thumbnail-sized clam blamed for clouding the azure bays of Lake Tahoe high in the Sierra Nevada has now turned up in a mountain-ringed Adirondack lake renowned for its limpid, spring-fed waters. But in Lake George, scientists call it an unwelcome invader that could cause ecological and economic harm. 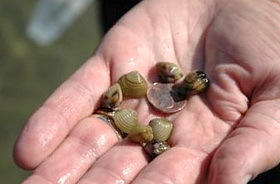 An intensive search launched after a few tiny clams were found at a sandy beach in August turned up no additional infestations, suggesting the invasion was discovered before it had a chance to spread across the 32-mile-long lake, a popular vacation spot. Since scattered numbers of Asian clams were discovered in Lake Tahoe in 2002, the population there has exploded, thanks to the mollusk’s ability to self-fertilize and release up to 2,000 juveniles per day. Their waste has helped trigger algae blooms that turned the cobalt blue water into bright green. Besides promoting algae overgrowth, Asian clams can also clog water intake pipes and other structures, and their sharp shells can befoul swimming beaches. The fast-growing clams, which mature in months, also compete for food with slow-growing native freshwater mussels, which can live 60 years. As part of a $1.4 million clam-eradication effort at Lake Tahoe, scuba-diving scientists unrolled long plastic mats on the bottom of coves this summer to smother clam populations that can reach concentrations of 5,000 per square yard. Asian clams were long believed to be unable to reproduce in cold Northeastern waters. The Darrin Freshwater Institute is on a section of Lake George once known as “Millionaire’s Row” for the mansions of wealthy industrialists that once graced the shore. Jeremy Farrell, a graduate student there, happened upon the invasive clams a couple of weeks ago when he was playing at a nearby beach with his toddlers. Further investigation by researchers dumping sand through brass sifters revealed thousands of clams ranging in size from a sesame seed to a peach pit. The institute and other Lake George environmental organizations contracted with Dan Marelli, a mollusk specialist based in Tallahassee, Fla., to lead a group of scientific divers in a survey of the invasion’s extent. The divers found no clams beyond the 2 1/2-acre area they first were found. The next step, Nierzwicki-Bauer said, is to develop a management plan. Most likely, that will involve placing the mats, called benthic barriers, on the sandy lake bottom to smother the clams. Organizations on Lake George have had success battling other invasive species. Eurasian watermilfoil, a fast-growing aquatic plant that crowds out native species and snarls motorboat propellers, has been held at bay with benthic barriers. And an infestation of zebra mussels has been virtually eradicated by volunteer scuba divers who hand-picked 25,000 of them from rocks. Asian clams don’t spread quite as readily as zebra mussels, which swim in the water as larvae and fasten themselves tightly to surfaces such as boats. The clams, which are sometimes used by fishermen as bait, are transported in bait pails and in water remaining inside of boats. They also may be dumped into a waterway by someone cleaning out an aquarium. Asian clams were first documented in the U.S. on the West Coast in 1938 and have spread to more than 40 states. While the cold Northeast was long considered inhospitable to the clam, German scientists on the Rhine River reported last year that moderate winter warming had a strong positive effect on the species.